Elderly Hildegard is a favorite of our family. It’s strange that we have such warm, sentimental feelings toward her. After all, she has a lot of quirks. But I guess her constant presence at many of our most important activities made her a member of the family. 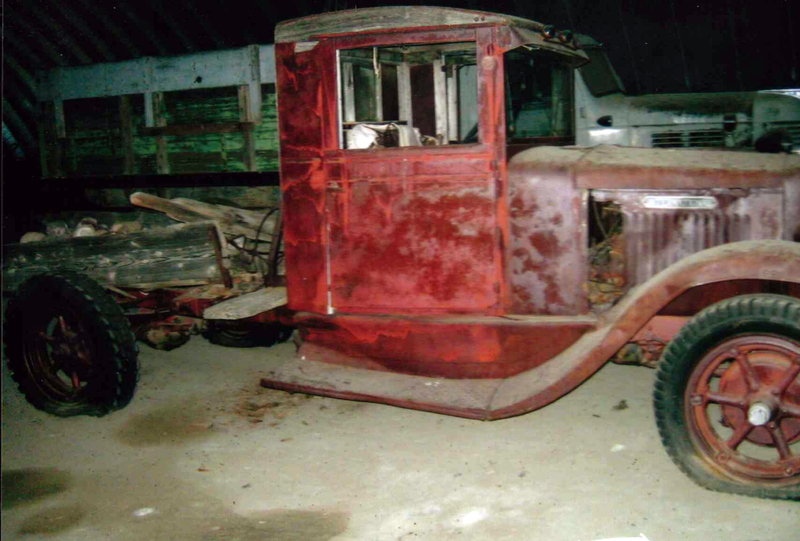 Hildegard is a 1932 Model A2 International truck. Purchased second hand in 1937 for $305, it was the first of many vehicles Pop bought from Buddy Dolan at Hannah & Holmes Implement in Shelby, Montana. This was an essential and cherished piece of equipment for Pete and Hannah Suta, who had just that year bought a farm west of Sweetgrass. All they had were a new mortgage on a low-producing dry-land farm, four pre-school children in a two-room house, and no money at the ending of the depression. This truck, an absolute necessity, seemed like a luxury. I don’t know when I became aware of her, she just was a constant presence throughout my life. Hildegard started out hauling grain, but most of the time she was known as our “rock truck.” This made her the center of attention all summer as our family surrounded her in the fields, picking up rocks that could cause damage to the farm machinery. Rockpicking was our family’s idea of quality time together. At first we not only had to put the rocks into the truck box by hand but also unload them by hand. 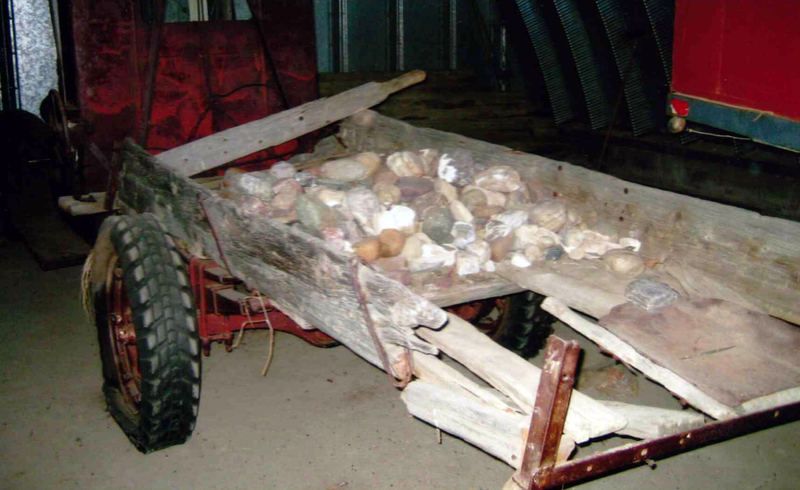 Pop soon converted the wooden truck bed into a dump truck by adding a hoist, or hand-operated crank and pulley system, to raise the front of the box which made the rocks slide off the rear end. Thank goodness! Handling those never-ending rocks just once when loading them was more than enough. Hildegard is beautiful in her simplicity. Her slender shape is very boxy, straight up and down, perched on high, narrow wheels. Thick unpainted slabs of wood make up the shallow truck bed. The original color of the body escapes memory. For me it has always been a weathered reddish-gray, the color of iron-oxide rust. Wide running boards gracefully curve down from the front fenders to help you step up into the cab. You could hitch a ride on those running boards, holding onto the door through the open window, but you never went far because you would be bounced off by the rough ride. Riding in Hildegard was an interactive experience. You felt every hole, rut, rock, or bump in the road —- there were no sissy springs on this truck. And there was no soundproofing to prevent you from hearing every decibel of her loud engine. Although riding in the back of a truck is fun for kids, you quickly learned that you would get slivers if you sat down in the wooden truck bed. To help the engine get started we often had to give a little push. That’s why we always parked her facing downhill. She stood on the hill just outside our front door, like a piece of sculpture visible every time you went in or out of the house. To keep her from rolling down that hill by herself, we put rocks under the front tires. Placing and removing those rocks required us to move quickly to avoid being run over or left behind. It was really tricky to handle the rocks when one of us was driving alone. If not parked on a hill, Hildegard sometimes needed her engine cranked to start. My brother Henry usually got to do that honor, placing a large metal crank into a hole in the front of the truck and using all his strength to quickly turn it clockwise. Meanwhile Teddy manipulated the choke in and out, regulating the amount of gas going to the engine, trying to give enough gas for it to start but not so much that the engine would become flooded. 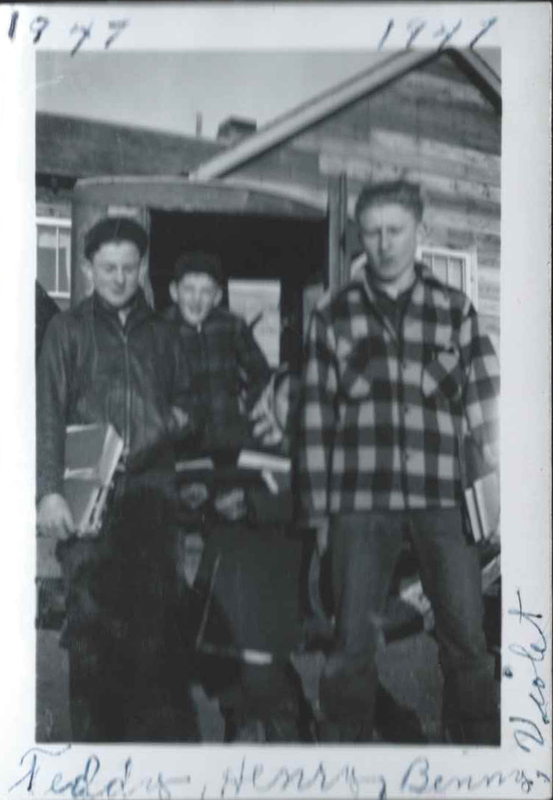 When our one-room school closed in 1947 and we four children started riding the school bus to town, Hildegard faithfully carried us a mile and a half each way to the corner where we caught the schoolbus. Picture four teenagers, three of them my older brothers, crowded into a cab about half the size of pickup trucks in 2012. Ted, the oldest, always drove. I was the smallest and sat on Henry’s lap with my head bouncing up and down against the unpadded roof. Ben was younger and smaller than Henry so he had to sit in the middle, also an uncomfortable place. Ben had to keep his legs moving to avoid being injured as Ted used the stick shift on the floor. The truck had a four-speed transmission plus reverse so there was a lot of clutching and shifting to be done. Unlike the stick shifts of today, there was over a foot of movement between each gear, making second gear and reverse very hard on Ben’s knees. Left to right: Henry, Benny, Violet, Teddy. Names were written on the photo in birth order. During the long Montana winters we had to first brush the snow off the seat before entering the cab. Obviously the doors weren’t airtight and the heater was nonexistent. Ted often drove with his left hand out the open window, scraping ice and snow off the windshield. When we got stuck in the mud or snow, everybody piled out and pushed. If that didn’t work we waited for Pop to come out with a tractor and pull us home on a chain. In any kind of weather it was always a happy sight to see Hildegard at the end of a school day, standing there at the corner waiting for us, like a loyal dog welcoming you home. Ultimately there were six kids in our family and all used Hildegard for some of their first driving experiences. Not all of the lessons learned from driving Hildegard were applicable to other vehicles. You needed what seemed like a mile to stop and an acre to turn around. I learned that lesson the hard way when I was about 8 years old and desperately wanted to drive like my older brothers. They had been taught to drive so they could work in the fields but I had to help with housework instead. Left alone in the house one day, I decided to take Hildegard out for a quick solo spin. This was my first time behind a wheel other than steering while sitting on Pop’s lap. Although I’d never driven before, I was independent enough to think I could do this without help. After driving just fine for about a mile, an attempted U-turn brought me up against a neighbor’s barbed-wire fence, coasting to a stop just inches from tearing through it. My heart almost stopped before the truck did. I knew I would catch hell if I tore down a fence. Frantic attempts to get the stick shift into reverse failed and the exhilaration of driving for the first time was replaced by fear and remorse as I walked the long distance home. Although my parents were never shy about bawling us out, I don’t recall getting into much trouble for this escapade. I guess Mom and Pop understood the magnetic attraction of Hildegard. After this aborted solo trip I was then allowed to drive, without any further lessons. I helped Mom by delivering lunches to the men out in the fields. The skill of driving wasn’t difficult to master but my small size was a barrier. I had to stretch out almost horizontally to reach the clutch and then couldn’t get enough leverage to push down on the stick shift as necessary to move it into reverse. Two pillows behind my back and another to sit on helped me reach the pedals and see where I was going at the same time. Having discovered my limitations I always parked to avoid the need to ever have to shift into reverse. Exactly how Hildegard got her name is somewhat of a mystery. Pop recalls only that “the kids” named her. She probably was named after a singer we heard on the radio. “The incomparable Hildegarde” was a famous singer of pop songs and star of the 1940s NBC radio program, “The Raleigh Room.” This beautiful lady who remained a star during several decades was known to have a flamboyant personality, wearing over-the-elbow white gloves and flashy long gowns in her performances, even for the live radio shows. That image would match the way we viewed our own incomparable Hildegard. No other vehicle on the farm, and eventually there were many, ever had the personality to warrant a name. Hildegard alone transcended machinery. Following about 50 years of active duty, Hildegard was retired and parked on a gentle slope next to the road everyone took to get to our house. Sitting there in the tall prairie grass, she still was displayed as a piece of sculpture for all to enjoy. There she functioned as a favorite playhouse for grandchildren, other child visitors, and mice. Today the seat is totally rotted but my brothers think the engine probably still works. My brother Ben decided to claim Hildegard when we held an estate sale on the farm in 2000. None of us could stand for her to be sold outside the family. Now, in her old age, Hildegard is finally protected from the elements, stored in a Quonset Hut where she awaits loving restoration by a caring antique collector. With her personality, she probably is feeling lonely but enjoying wonderful memories of family. Maybe we will figure out a way to keep her in the family throughout future generations. As the story describes, I grew up on a farm in Montana just 8 miles from the Canadian border and about 70 miles east of Glacier Park. After getting a degree in nursing at Montana State University in Bozeman, I literally picked Madison, Wisconsin off the map as the first place I was going “on my trip around the world.” I got delayed by marriage, 3 children and administrative positions in facilities including University of Wisconsin Hospital and Clinics. Trips to many different countries came later. For the last 20 years before retiring, I had my own nurse consulting business. The emphasis of my nursing practice was on development of nursing staff at all levels. Experience presenting at national nursing conferences and publishing in nursing journals actually made it more difficult to write this story. Scientific writing and writing policies and procedures requires elimination of all but the most essential words. It took a lot of work to put descriptives into this story of my beloved Hildegard. I hope you enjoy my efforts.